Nutritious, calorie-rich foods promote healthy weight gain. Being underweight might not gain you as much sympathy as excess pounds, but it can pose serious risks. Carrying too little weight can hinder your bone health, immune function and energy levels. In severe cases, underweight complications can be life-threatening. In addition to addressing underlying causes such as stress, depression and wasting diseases, a nutritious, calorie-rich diet can help you healthfully add pounds. If your symptoms are unexplainable or severe, seek guidance from your doctor. Dairy products, such as milk, yogurt and cheese, provide valuable amounts of protein, calcium and vitamin D. Rather than adding empty calories to your meals, the Academy of Nutrition and Dietetics recommends adding nutritious ingredients to your meals and snacks. 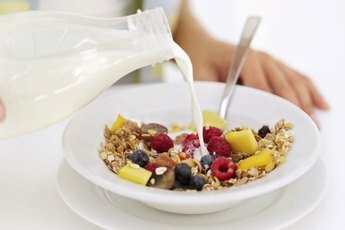 Preparing cereals with milk rather than water and adding powered milk to cooked cereals adds significant amounts of calories and nutrients to your meal while allowing you to stick to reasonable portion sizes. For similar benefits, add shredded cheese to soups, mashed potatoes, pasta and sandwiches. If saturated fat is a concern, choose low-fat milk products. Otherwise, whole milk and high-fat cheeses contain more calories per serving. A healthy diet can reap up to 7 percent of its calories from saturated fat, says the American Heart Association, or up to 140 calories within a 2,000-calorie-per-day diet. Snacking between meals plays an important role in weight gain, according to a "Today's Dietitian" article published in January 2008. Because nuts and seeds are dense in calories, you can reap valuable amounts of calories from even modest-sized portions. Six almonds, for example, provide about 180 calories. To get a similar amount of calories from saltines -- which are significantly less nutritious -- you'd need to eat nearly 15 crackers. Nuts and seeds also provide healthy fats, making them heart-healthy alternatives to fried snacks, such as potato chips. To gain a variety of nutrients, snack on mixed nuts or trail mix, and add nut butters, such as peanut or almond, to crackers, bread and fruit slices. Like nuts and seeds, plant-derived oils provide rich amounts of calories and nutrients per serving. 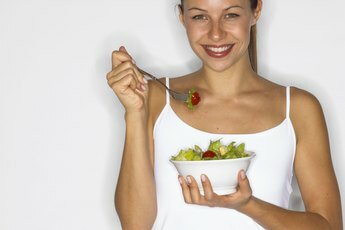 The Academy of Nutrition and Dietetics recommends garnishing salads with olive oil for healthy weight gain. 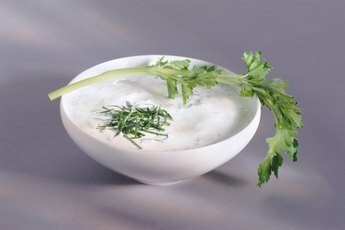 Salad dressings based on healthy oils provide flavorful, high-calorie dips and toppings for fresh-cut vegetables and crackers. You can also brush vegetables, bread, fish and meats with olive or canola oil before cooking for added flavor, nutrients and calories. Choose grilled cheese brushed with olive oil over a plain cheese sandwich, and select oil-coated potato wedges over a plain potato. Many cakes, cookies and breads provide plenty of calories. By choosing whole-grain baked goods, you'll reap more vitamins, minerals, protein and fiber. The McKinley Health Center at the University of Illinois Urbana-Champagne recommends heavy breads, such as pumpernickel or whole wheat, and dense cereals, such as granola and raisin bran. You can also increase the calorie and nutrient content of cereals, yogurts and smoothies by adding powdered wheat germ. For a calorie-dense bedtime snack, which can also promote healthy weight gain, top a whole-grain bagel with hummus or peanut butter or a bowl of granola with low-fat milk.